Women, please excuse. Do not bother to read further. Man, Had a great day..! Were first words from a roommate he entered our apartment. These are not uncommon to ears. “I knew I’d do we, I had my lucky pen with me! !”,were next. Lucky charm. Had a good day ? May be you too had some association with your unknown lucky charm today. Lot of people, I see, who believe in their lucky charms. Lucky Shirt, lucky coin, lucky face ( aah, I remember one at College). However, sometimes, it might just not be a case, may be your lucky charm betrays you and nothing seem to happen right and you’d try your luck on some other lucky charm. 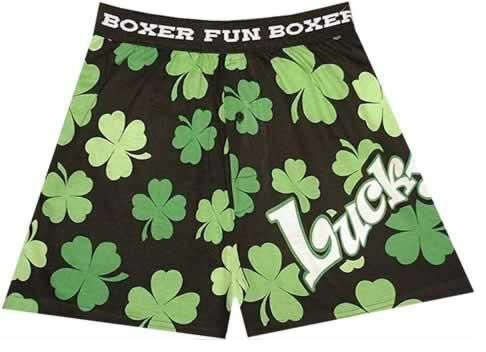 Ever tried your hand at lucky underwear ? It is a bold statement. Lucky Underwear. Not because it is obscene to mention about something that is very un-reveal-able, but bold because of your confidence in it that it’d never let you down, bold because, I’ve known people who’d (disgustingly) wear same one for days together, for they have their exams lined up everyday. Superstitiously lucky, however unhygienic, underwear, does not come in different shape sizes and color. Everyone has only one, for one cannot have two same lucky charms. I really wish to see how my day passes when I am in one of them. Who knows, I may have an association with my “unknown” lucky charm. And, if you’ve already known, What’s your color ? This entry was posted in Shrikant Shelat on June 30, 2008 by Shrikant Shelat.